The official guide to the “Navigating in an Ever-Greening World” Annual Environmental Summit, hosted by the Industrial Environmental Association and the California Manufacturers & Technology Association. Wednesday's tracks include sessions on water quality and minimization, and compliance. Tuesday's tracks include sessions on climate change, managing your carbon footprint, air quality, and more. It’s a new era for doing business in California. Climate change, green chemistry, water quality, health, safety and security programs are all having a profound impact, creating both new opportunities and challenges. July 22, 2010 -- Erin Stack, "office guru" for Asymmetric Publications, talks about "Kingdom of Loathing" and the conference's potential change of venue. The official program guide to the 2011 Industrial Environmental Association's annual statewide environmental summit. The Daily Transcript presents the official guide to the sixth annual Industrial Environmental Association conference, "The Greening of California Businesses." The Daily Transcript presents the official program for the 5th annual Environmental and Regulatory Issues Conference & Exposition on Nov. 14-15. Hosted by the Industrial Environmental Association, the conference addresses issues such as air quality, climate change, hazardous materials, chemical policy, water quality, sustainability, biotech and plating. 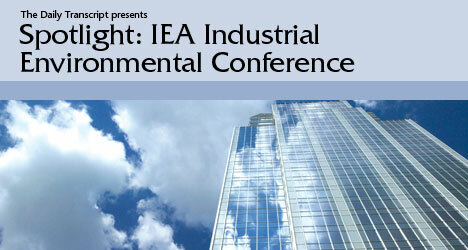 This special report serves as the program guide for the Industrial Environmental Association's Fourth Annual Environmental and Regulatory Issues Conference & Exposition to be held Dec. 13 and 14. The conference, which is hosted by IEA and CMTA, addresses climate change, air quality, hazmat and water quality, as well as biotech issues.